A long, long time ago (last Fall)... I helped moderate round 4 of the Schnitzel and Boo mini quilt swap. Everyone in my group shipped their package. Except for one. Once I gave up hope on the sender, I let the recipient know that I'd be sending her an angel swap package (a replacement for a missing package). I also warned her that it would not be done in a super timely manner. The holidays were upon us and my dad had recently passed away. Well... that turned into a Q2 finish as I didn't end up shipping to her until April. Eek. However, I'm really happy with my finish and I hope she loves it, too! I decided to go with this star block from her Pinterest idea board and she mentioned Cotton and Steel in her likes. I chose a Modern Background Paper fabric from Zen Chic for my background. I love these! Great low volume and some (like this one) have text. I went with some uneven matchstick quilting. Totally outside my normal palette choices, but I'm very happy with it. Thank you for visiting. 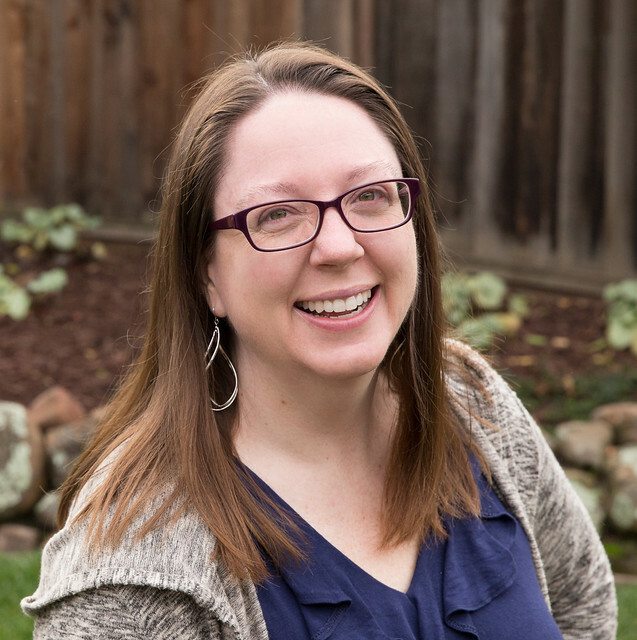 I'm linking up to the Q2 FAL Finishes Linkup. See all my Q2 goals here. 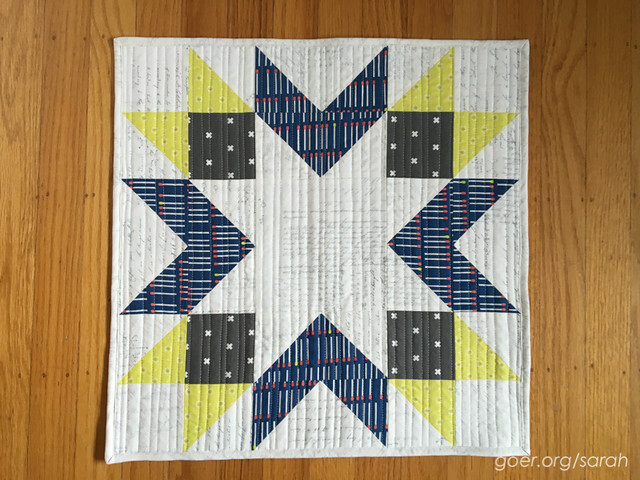 Posted in Quilting on July 7, 2016 by sarah. I think that with everything else you had going on in life it is still gracious and wonderful for you to have followed through to make and send her something. I hope she loves it and really appreciates your wonderful kindness. I'm sure she will be delighted! And like you, I love Modern Background Paper low volume fabric. 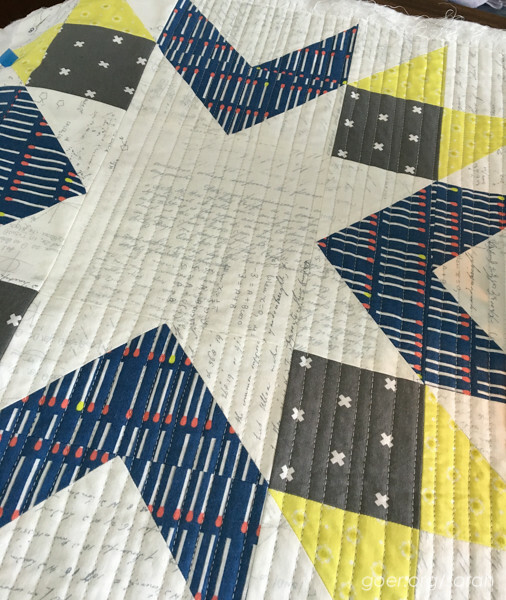 This mini quilt is definitely worth the wait! Thank you, Mary! I was just thinking I need to order more of it. Maybe the background for the new mystery quilt? Thank you for being an angel swapper (and a talented, generous, and dedicated one at that). Swaps happen because of you! This is really lovely and yay for you being an angel! I’m visiting on behalf of the FAL hosting team – thanks so much for joining us!